Our roaming team of iPhone-wielding data collectors drove down the west coast of Sweden over the past few days, dramatically improving our coverage of Göteborg and Helsingborg. Helsingborg in particular is important to Nelso as it's right across the water from Helsingør, Denmark and is a popular destination for users of Nelso.dk, our most popular site. Using our proprietary iPhone app to collect data, a team of four has completed data collection for the center of Oslo, Norway in less than a week. Each user added on average 250 places a day. We now have more verified listings (business data checked by our staff in the street) in Oslo than we have in Copenhagen, our current #1 market. Is the GoogleBot finally paying attention to microformats? 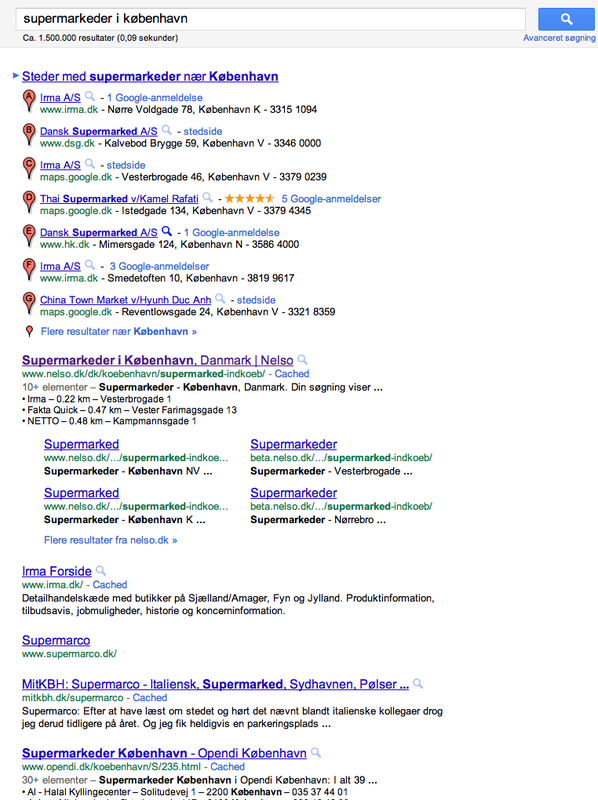 While checking our ranking on various Google local sites, specifically "supermarkets in Copenhagen" ( Supermarkeder i København), we came across this page in the results (see screenshot if the page has changed since I posted this). Below the main link to the Nelso.dk site, it says "10+ records" and then goes on to list some of the records in a way that leads me to believe that they are finally showing end users the results of parsing hCard microformats. I'm sure the GoogleBot has been collecting microformat data for a long time, but this is the first time I've ever seen our listings actually improved by the fact that we are providing this data.